My daughter Emma and I made the trip out to West Point for the Army Spring Game Friday night. In addition to Spring Football, we also saw a few of my classmates out there, so that we wound up having a terrific time despite a bit of rain. And really, it was awesome seeing some football. I will say, though, that the Friday night time slot isn’t super-convenient–at least for me. I get that with Army Baseball playing at home, Mens’ and Womens’ Lacrosse playing Navy Saturday afternoon, and Sandhurst, there was way too much stuff happening this weekend to try to schedule the game at a different time. Still, driving out to West Point required fighting New York-area rush hour traffic, and that’s never easy. We wound up out-flanking the Tappan Zee Bridge, but even so, it still took us almost two hours to get all the way to Michie Stadium. 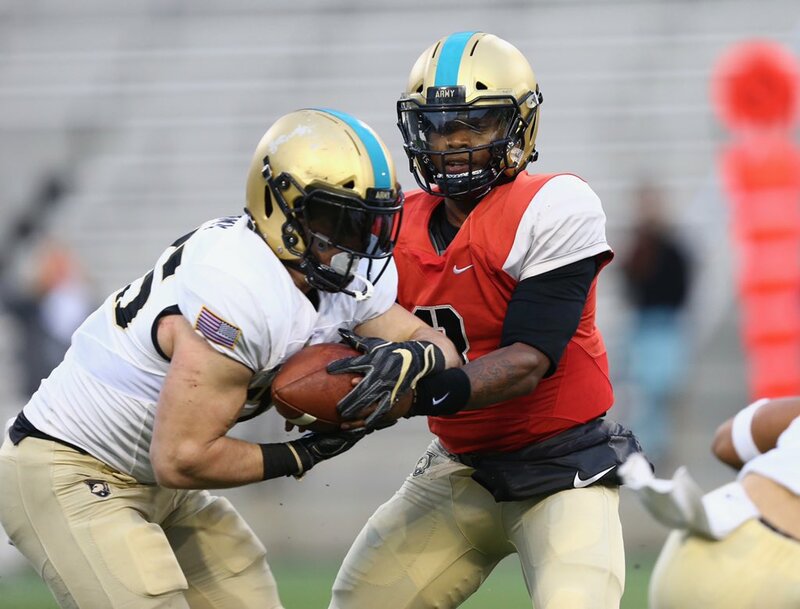 Army’s offensive squads generally looked better than they have in past scrimmages. The defense tends to be ahead of the offense at this time of year, and especially with the style of offense that Army runs, putting the quarterbacks in red no-contact jerseys significantly degrades the team’s offensive effectiveness. Starting quarterback Kelvin Hopkins was the only guy in red this particular Friday, but you could tell that it hurt him. They were calling him down every time a defender so much as laid a hand on him. Even so, we arrived just as SB Kell Walker took a pitch 80 yards for a touchdown for the Gold team. That came about ten minutes into the first quarter, and from there, the game featured quite a bit of scoring. Throughout most of the game, two of Army’s younger quarterbacks, Tyhier Tyler and Jabari Laws, led their respective teams a series of mostly good-looking scoring drives. The backup quarterback battle got the most attention coming into this game, but rising firstie FB Rashaad Bolton had probably the best game of any player on the field. He started for the Black Team and looked absolutely terrific out there. Like a slightly faster, more powerful version of Calen Holt. I didn’t see him break off any long runs off the Fullback Dive, but he caught the ball well out of the backfield, ran a guy over on a 33-yard screen pass, and tied the game with the key catch at the end of regulation. Nothing’s set in stone, of course, but I think Bolton played himself into the rotation this spring. I expect we’ll see him quite a bit in the coming season. For most of the scrimmage, we saw Tyler at quarterback and Bolton at fullback for Black against Laws at quarterback and Barnard at fullback for Gold. There were some slotbacks and wide-receivers who made plays as well–or who were at least targeted on some throws, anyway–but with Army runs its offense, it was the quarterback/fullback combinations that stood out from the stands. With that said, though, a legitimate knock on Tyler is one that we see at times with Perry as well. Both guys have a tendency to try to do everything a little too often. Admittedly, it’s a tough balance. When Tyler escapes the initial pass rush, breaks contain, and goes for a long run, he’s a hero. When he escapes the initial pass rush, gets bottled up, and then takes a sack, he’s a goat. He took at least one sack on Friday where he should have just thrown the ball away. So okay, once is fine. This would be a bad pattern, though. QB Jabari Laws isn’t quite as fast or as accurate throwing the football, but he’s a little bigger and a little stronger running inside. He also makes good decisions in the triple-option offense, and that’s key. It’s this skillset that made Ahmad Bradshaw so deadly in the triple-option. One of the hardest things for a young quarterback to learn in this particular offense is when to let his teammates make plays. Laws has that. He distributed the ball well, leaned on his very capable fullback, and made good use of his slotbacks on option-pitches. I don’t think it was a coincidence that Barnard had more Fullback Dive plays than Bolton, who was in with Tyler. It’s harder to evaluate defensive players in a game like this, especially from the sidelines. I heard LB Jon Rhattigan’s name called a few times on tackles, probably because I was listening for it. Anyway, it sounds like he might be in line to contribute next year, though he’s just one player that I happened to be watching for. I also missed the fourth quarter, which was pretty exciting. We left just as the rain started coming down for real–as the third quarter was ending. The Black team was up by six at that point. So I missed Hopkins and Laws bringing Gold back to take the lead, only to have Tyler bring Black back again and re-tie the game. A Bolton catch in the end zone sent the game into overtime. Black then won in overtime, and Tyler got interviewed by beat writer Sal Interdonato as the game’s hero. That was pretty cool. So that’s it, and now Spring Football is over. Friends, it’s gonna be a long, hot summer without any kind of college football whatsoever. We might have to try to do something about that.